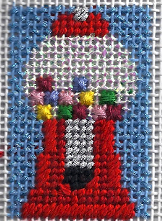 Cotton Petites were used to stitch these colorful gumballs. With a big trade show (TNNA) early next month, companies are already showing off great new products. There’s sure to be lots more. Even so, these exciting new releases have me asking some to hide my credit cards. Labors of Love has some great new designs. I’m particularly fond of a family of dressed-up bunnies all ready for an Easter stroll. Mom, Dan and three kids make a great group. Stitch guides by Laurie Walden are available. There is also a new series of dogs with patterned patchwork backgrounds. They will be expanding the number of breeds in this line. My favorite of their new pieces is their new three-piece nativity. Cleverly, Baby Jesus’ manger is Sudberry’s vintage pincushion. Both Mary and Joseph are accompanied by animals. Needledeeva has several great new series. These are wonderful for stitchers at all levels because they have bright colors, great designs and are stitch-painted. There is a series of eight floral designs, with two more coming next month. There is also a great series of seven designs just for beginning stitchers. There are new Christmas designs, including a wonderful poinsettia. The Collection has a patriotically-colored bald eagle against an American flag. There is a stitch guide available. They also have several sets of 4″ round ornaments that are softly shaded. They come in blue, red, pink, green, silver, and gold. Kelly Clark has a charming bee skep ornament that starts her newest club. This design has real classic Kelly Clark style. The popular Annie Lane canvases from Wellesley Needlepoint have several delightful new designs, including Sheepy Wicked and Dirty Martini. Quilt Squared III is the latest charted geometric from HandsOn Design. It’s an off-center log cabin in sunshine & shadow coloring. DMC has also introduced a lovely geometric counted canvas design that features all 16 of their newest floss shades. Melissa Prince has added to her lovely bird rounds with a set of six rare birds in North America. She also has a new nautical birdhouse with “for the birds’ spelled out in signal flags. Jean Smith has two new canvases of single flowers in groovy bud vases. One has realistic Gerbera daisies, the other more abstract flowers. There is also a new Fantasy Garden available in two sizes. There are also four new more traditional bouquets on white backgrounds. JulieMar & Friends has 15 new small weekend projects, just in time for Easter. They also have eight new floral designs, including Orange Zinnia and Daisies. The latest in the Seasons series from & More, Winter Solitude features ribbon embroidery and lots of beads. Sally Corey has a new canvas based on motifs for an Indian wedding. Susan Roberts has a new spiral design that is psychedelic in design but in an analogous color scheme of blue, sage green, and violet with black. Leigh has a lovely series of Christmas Candle stockings. These rick and elaborate stockings have tone-on-tone backgrounds, lovely painting and rick needlepoint “fabrics.” The Point of It All has added a charming set of three floral canvases from Espirt de France. These designs have a very Mary Englebreit feel to them. The lovely thin “Petites” threads from Sulky (reviewed here) are equal to two strands of floss. The company has introduced several six-color collections. They include springtime pastels, summer brights, and “Many, Many Welcomes” (coordinates with a Rosewood Manor pattern). There is also a six-pack of the blendables colors, that change color rapidly and randomly. Gentle Art has new colors in their crewel-weight Simply Wool thread. They are Portabella, Strawberry Parfait, and Licorice. The new floss colors include Loganberry, Moss, and Licorice. Treenway Silks has special thread collections for Garden of Silken Delights from DebBee’s Designs. The original colorway has been joined by a new autumnal color scheme. Weeks Dye Works has four new colors in their floss: Cattail, Terrapin, Verdigris, and Amethyst. Chic-a has a new generously-sized All Clear zipper pouch. It’s their biggest pouch yet and the zipper is trimmed with their fun oilcloth prints. ThimblePack Plus combines five popular thimbles pads and accessories. The package contains a ThimbleCrown, a ThimbleDimple, both with adhesives, and more than two dozen disposable thimbles in three styles. Everything is packaged in a storage box. Doodlin’ Around Design has a new wooden box storage container, It comes with a wood insert that can be engraced as well as foamcore for mounting needlework to replace it. It comes in several sizes and in four different woods. EdMar makes a premiun gold-eye needle that comes in easy-to-reuse plastic vials. They are available in Tapestry needles as well as in several other types.